The scenery is stunning around Ninh Binh, which is a very laid back city in the Red River Delta region without too many foreign travellers. Love finding the non-touristy places but also bracing myself for Haiphong and the Ha Long Bay onslaught next week! 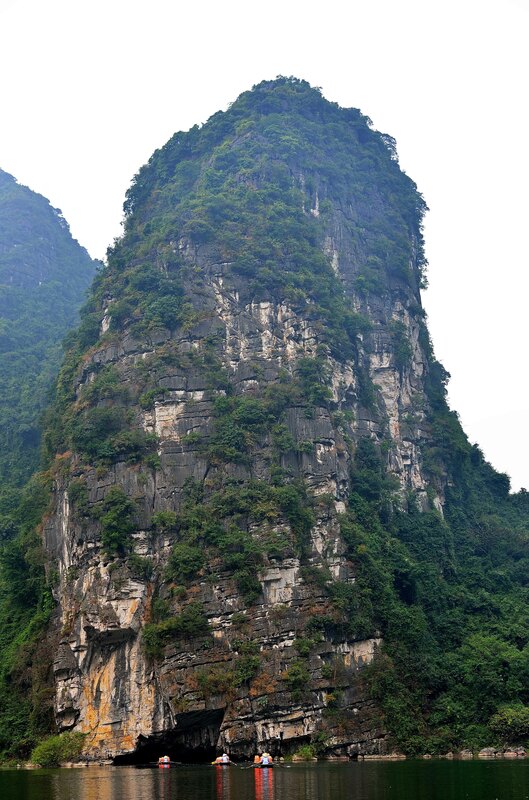 The 8-hr Reunification Express train from Dong Hoi travelled through some amazing limestone karst scenery. But alas, I couldn’t take any photos as the train was too bumpy and a little too quick; one for the library of memories only. 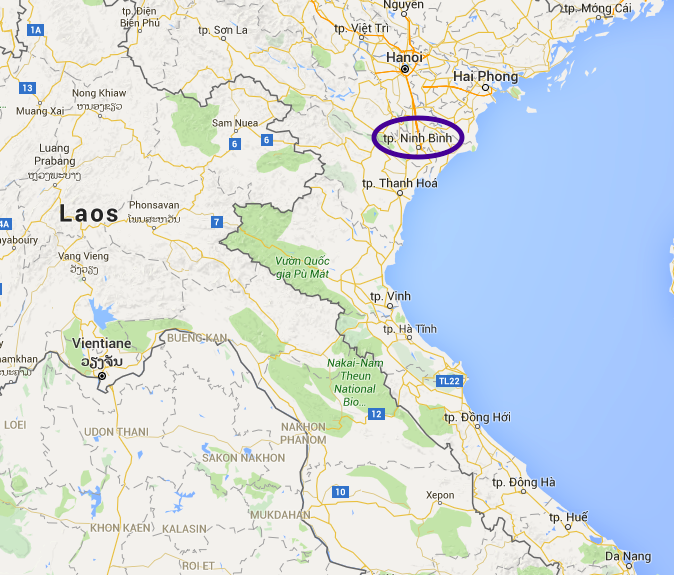 Update: As of June 2015, trains only stop in Ninh Binh’s new train station (about 1 kilometre south of the old station). Try and visit the Cúc Phương National Park, which is famous for the Endangered Primates Rescue Centre, bird watching, orchid flowers, thousands of colourful butterflies (best months April and May), and forest walks. 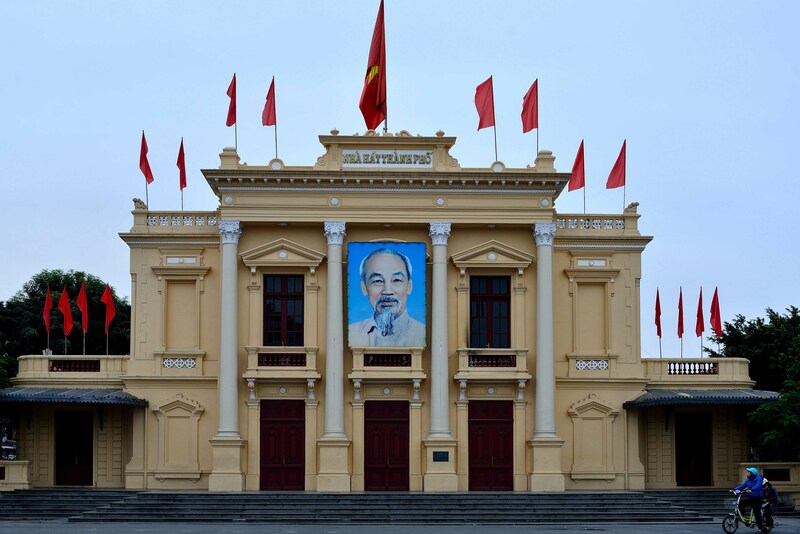 Decided to hire a car and driver from the Kinh Do Hotel for the day (USD$48) to see the main sights. Although the driver knew only a couple of words of English, he was very good, accommodating, and drove safely. 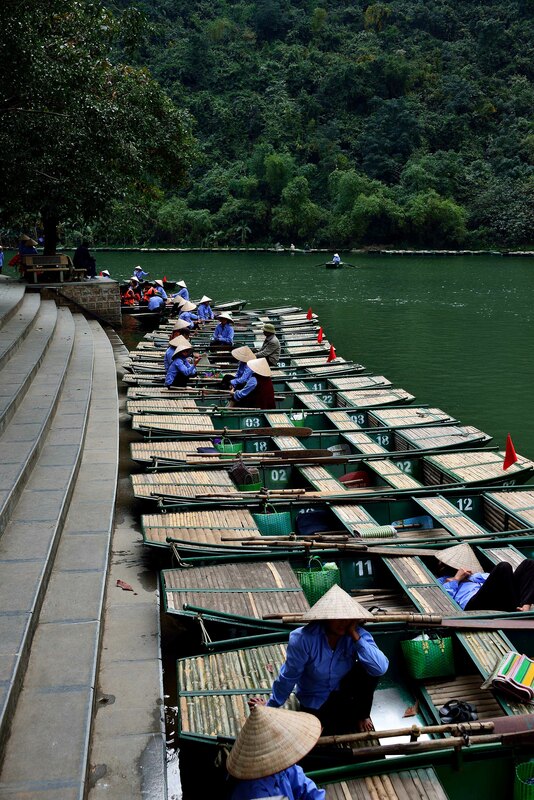 A little expensive for 2 people, but a great way to get around as the main sites are spread out around Ninh Binh, which included Trang An Cave, Bai Đính Pagoda, and Hoa Lu temples – enough for one day. 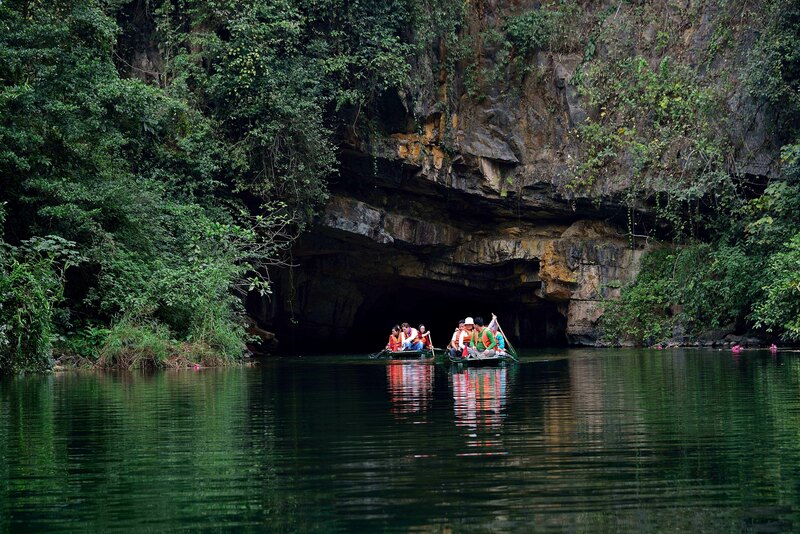 This area is permeated with a network of caves, and bound together by flooded inland waterways, which ensures another excellent caving experience since the Paradise and Phong Nha caves. 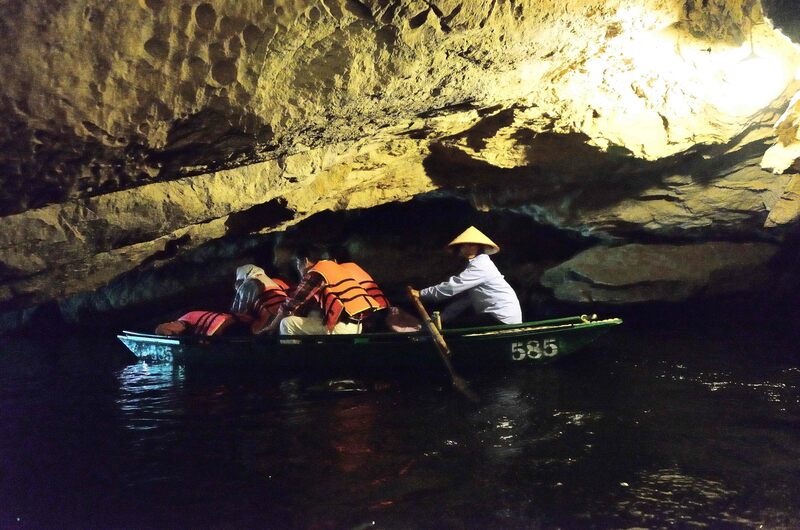 This time in a small rowboat for about 3 hours, which skilfully weaves its way in and out of very low rock formations inside 9 caves of various lengths, up to 330metres. 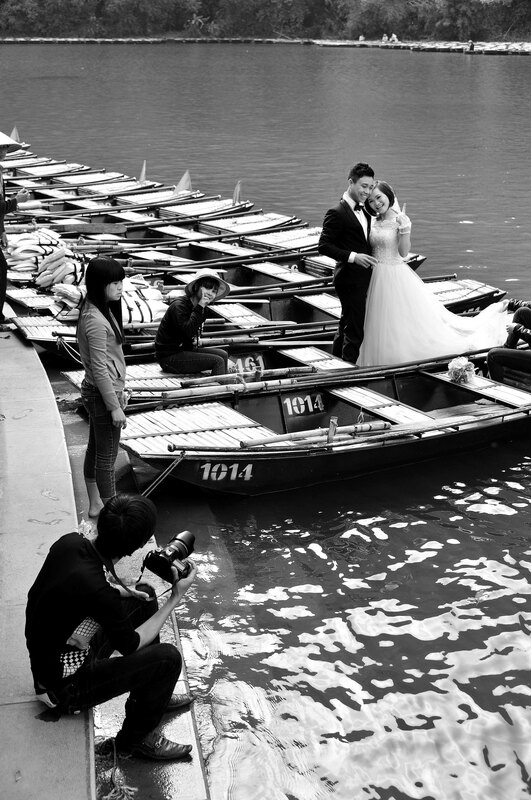 Remember to duck low whilst the boat moves through the chambers otherwise you’ll hit your head on the low rock ceiling. 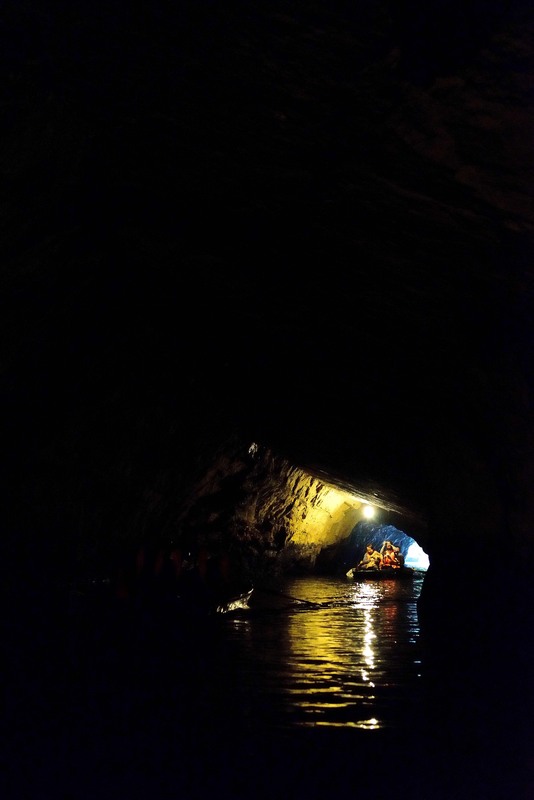 The boat emerges from the dark cave and glides quietly through the water around dramatic jagged limestone karsts rising high above the river. Apart from low lights every 30 metres or so, this cave is very dark and very hard to photograph. You’ll see magnificent views of the river valley below dotted with limestone Karsts around this multi-level Pagoda (30,000VND for golf cart one-way). A massive main entry gate hints at the size of this complex and either side of the entry begins a long covered walkway, which climbs to the top of the hill. Each side of the walkway is adorned with 250 hand-carved marble Buddhist Monks (totalling 500); and each statue has its own name and character. 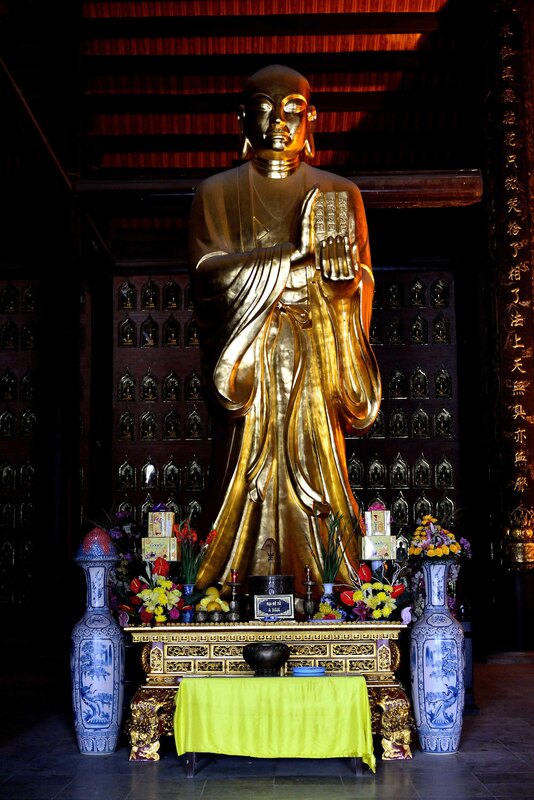 Behind these statues and built into the walls are thousands of gold Buddha’s encased in glass frames. This is a fairly recent complex, which needs a couple of hours to get around. 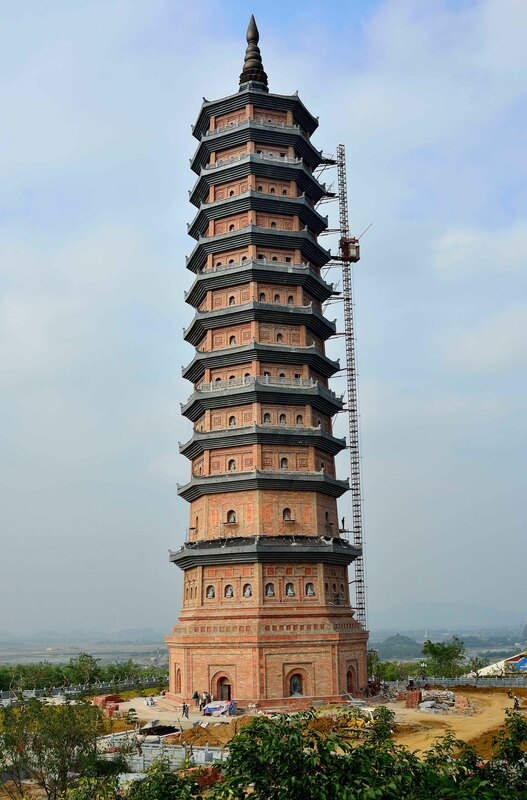 If you have time, the original Bai Đính Pagoda is located in the foothills some 800 metres from the new temple. I didn’t see too many foreigners at this complex. Although the ancient capital of Vietnam until 1010, there isn’t too much remaining these days except for some beautiful archways; worth seeing though. At 10,000VND entry, it’s cheap enough. Be careful of the touts giving you information about the temples then trying to charge you for the privilege; there are also beggars around this area. Kinh Do Hotel (18 Phan Dinh Phung) – Good breakfast included and you can select from several dishes. The downfall of this hotel is that it’s too close to Highway 1 and if you’re a light sleeper (like me), you won’t be sleeping much as there’s only about 2 or 3 hours early in the morning where the traffic quietens down. Pre-booked and paid online for 4 nights, so kind of stuck. Wi-fi in room is OK; room is serviced daily, toiletries provided, and good service from staff. Kinh Do Hotel – Good fresh local food at reasonable prices. Sad to be leaving Ninh Binh’s gorgeous region today but travelling onwards for a stopover in Haiphong, before the onslaught of Ha Long Bay. Booked a ride in a minibus (90,000VND) from the Kinh Do Hotel. Inevitably, the minibus driver was a maniac and the amount of near misses in the 2.5-hour trip from Ninh Binh was astounding! Oh and I saw the 8th accident in 7 weeks of travelling in Vietnam; not a good tally really. Knew there’s a good reason for catching trains most of the way so far; although slower and more expensive, I’m still here to tell the tale! Not too much to see in this city as it’s more of a stop-over for Cat Ba Island, if you don’t want to stay in Ha Long City, which is supposed to be quite seedy. 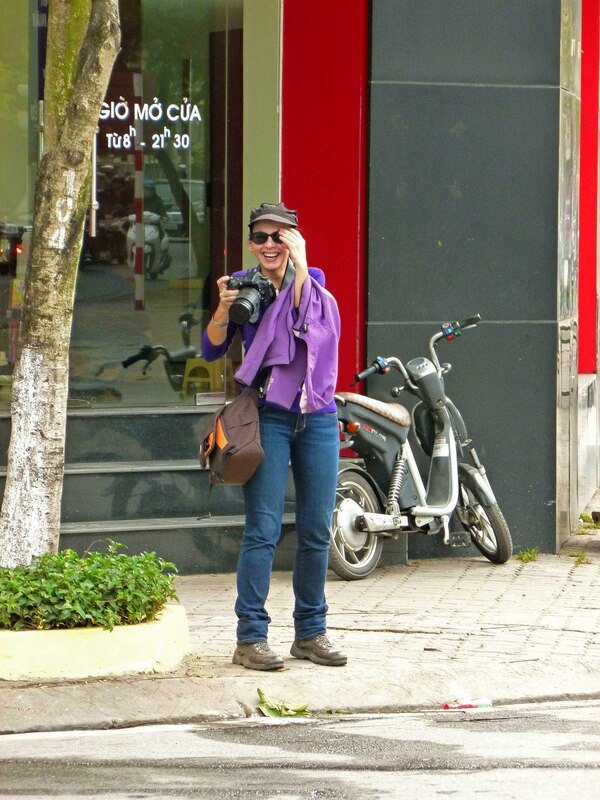 If anyone has any comments on Ha Long City, I’d love to hear from you. 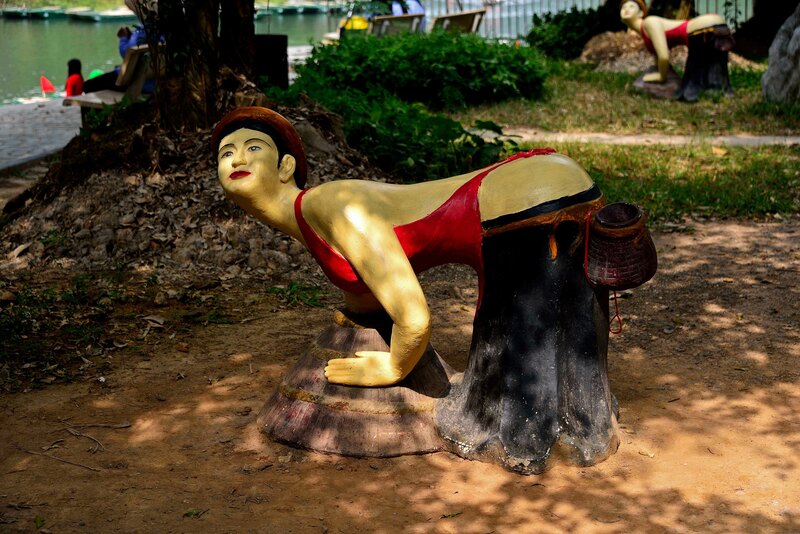 The lovely thing about Haiphong is that the locals are very friendly, especially when you sit and have a coffee in the park area. Someone will always shout a friendly ‘helloo’. Foreigners appear to be a rarity in this city. 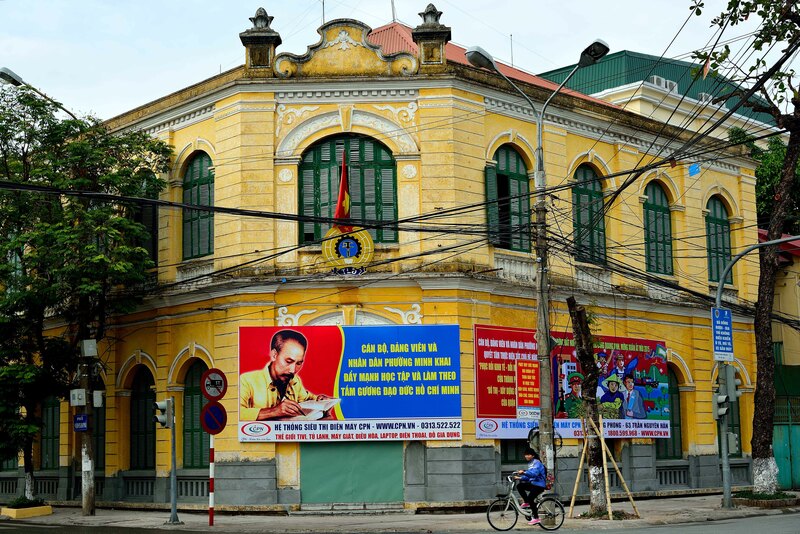 Take a walk around the city and you’ll soon stumble upon lovely old colonial buildings and many Ho Chi Minh banners or billboards. The room is a little small and the hotel is about a 15-minute walk from town. There’s not much English spoken at this hotel although this normally isn’t a problem. However, the online booking for the room included breakfast, which staff didn’t seem to understand. On the first morning, the frosty reception lady tried to charge us additional for breakfast, which was obvious that it was delivered from an outside street stall or restaurant. On the second morning, we didn’t get breakfast at all, so didn’t push the issue as it was just too hard. Pizza Hut (23, Minh Khai, Quận Hồng Bàng) – Succumbed to the lovely scent of pizza dough and mouth-watering tomato flavours whilst walking past this establishment and ate dinner here…it happens, even in Vietnam. The quality is good and price is reasonable, just needed a fix! Bracing myself for the onslaught of Cát Bà Island and Hạ Long Bay. Bought the Hydro ferry ticket (220,00VND one-way) to Cát Bà Island from the terminal without any hassles. This trip is supposed to take about 50 minutes…let’s hope so. Visit Nilla’s Photography for more images. 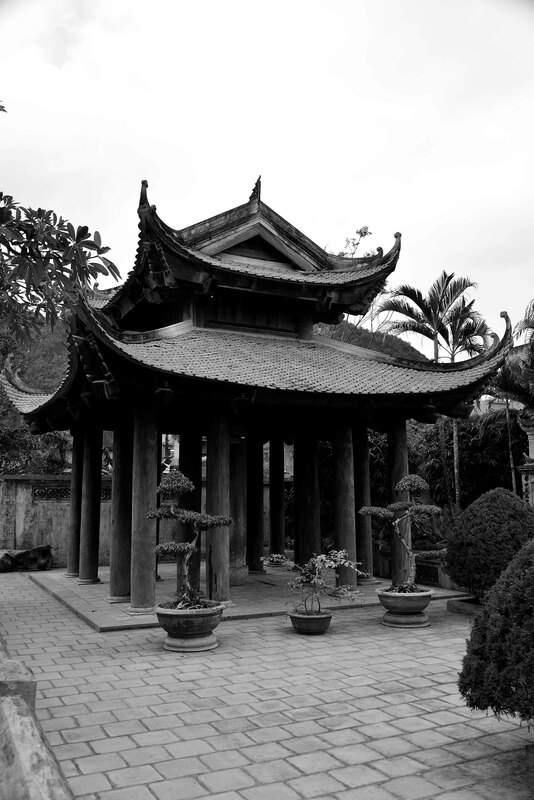 More Vietnam posts at Image Earth Travel. of this website, this weblog is in fact awesome. Thanks for your feedback and glad you found my post educative and engaging. I try to be as objective as I can and hope this comes out in my writing. Thank you for forwarding my post and taking the time to comment, I really appreciate it! Thanks for some other informative web site. Where else may I get that type of info written in such a perfect way? Hi, thanks for taking the time to comment – very much appreciated! Thanks, glad you enjoyed this article!